If you have been following the machinations by the Obama Justice Department [sic] over amending the ASCAP and BMI consent decrees, you may have found yourself wondering who was responsible for rejecting the good faith efforts of the songwriting community in favor of a cynical back room deal with multinational tech companies and broadcasters. I have some thoughts about this, and ask your indulgence–it will take some of your time to read this timeline, but I think you’ll be glad you did. As you read, ask yourself this question: If it looks, acts and quacks, is it corrupt? And if it is, what can you do about it? As I understand it, Obama lawyers made clear to at least the songwriter groups invited to participate in private conference calls that there was one person pulling the strings. That’s consistent with the public statements from SONA and the NMPA. We can infer that person did so probably with the blessing if not the instruction of the White House. I suggest to you that the Obama Justice Department’s ruling on 100% licensing and partial withdrawal is so illogical and divorced from reality that it can really only be understood in one way–corruption. And this is why the House and Senate Judiciary Committees need to investigate what really happened here. And credit where credit’s due–the idea for this investigation comes from Rep. Doug Collins and the questions raised by Rep. Hakim Jeffries, Rep. Jerry Nadler and Rep. Judy Chu. As MTP readers will recall, a Silicon Valley lawyer named Renata B. Hesse was appointed to oversee the sections of the Antitrust Division of the U.S. Department of Justice, and was recently appointed to oversee the entire Antitrust Division. After that elevation, her portfolio still includes Litigation Section III–run by a lawyer named David C. Kully–which itself has responsibility for the entire entertainment industry and newspapers among other sectors of the U.S. economy. On July 12, 2016, Rep. Collins called for an investigation into conflicts of interest at the DOJ on its handling of the ASCAP and BMI consent decrees, and was he ever correct. Of course, if the Obama Administration intends to request Senate confirmation of Hesse and William J. Baer (a long time Washington Establishment type who is now Acting Associate Attorney General), that will be an excellent opportunity to raise some of these questions. Since I’ve been known to be a betting man, I will tell you right now that I doubt seriously whether Hesse will ever see a confirmation hearing in the lame duck term of President Obama. And since Baer was recently confirmed in his last role at the DOJ, there may not be a pressing need to go through the confirmation process with him, either. But we can dream. Ms. Hesse appears to be the thought leader behind imposing 100% licensing on the songwriter community. I arrive at this conclusion by process of elimination, as the DOJ professional staff do not appear to be taking credit for coming up with it on their own. Ms. Hesse is the one who has authority over the process, at least most directly, so if the DOJ professional staff did not originate the idea, and if no one in the voluminous consent decree public comments came up with it, it must have come down from on high. At least within the DOJ or even higher. However, it is worth noting that the ASCAP/BMI consent decree review started before Hesse took over as head of the Antitrust Division from Bill Baer. I doubt that Ms. Hesse came up with this all on her own, so I asked myself how did this person end up being in the position she is currently in with the authority to do so much damage to so many people who don’t deserve it. Not to mention the fact that when it comes to anything that the Google network touches, which is pretty much everything in human experience, the U.S. Government–at least currently and unlike their European counterparts–only seems to be interested in enforcing the antitrust law to protect Google, not to challenge it. So how did this relatively obscure lawyer end up where she is? Let’s take a look at a timeline of events in Ms. Hesse’s career. I started a few months ago by reading Ms. Hesse’s official biography on the Justice.gov website, but noticed immediately that it omitted large chunks of her most recent career path. That omission led me to look elsewhere in other public sources, such as the White House visitor logs and other public sources. After graduating from Clinton alma mater Wellesley and Boalt Hall at Berkeley, Ms. Hesse worked at Brobeck, Phleger & Harrison for 7 years. Brobeck was a casualty of the Dot Bomb Bubble explosion and went out of business in 2003. Ms. Hesse’s LinkedIn profile tells us that she left Brobeck in 1997 and joined the U.S. Department of Justice in 2002 as Section Chief of the Networks and Technology Enforcement Section of the Antitrust Division where she worked until 2006 when the revolving door deposited her at the top Silicon Valley law firm of Wilson Sonsini Goodrich & Rosati (the major Silicon Valley competitor of Brobeck when Ms. Hesse worked at Brobeck). ANTITRUST SOURCE: [Intellectual property] is an issue that you’ve been very invested in personally. Why is that? RENATA HESSE: I actually started out as an IP lawyer, and so this has always been an area that’s been of interest to me. I also have historically worked a lot in the technology sector and the tele- com sector in particular. As a consequence, this was a subject matter that was innately interest- ing to me and an industry sector that I was familiar with. And I kind of like it; it’s fun and interesting and it’s important. But I don’t have a personal agenda here, other than trying to ensure that consumers get the benefits of competition and do not see higher prices or less innovation as a result of conduct that harms competition. I often say that the fastest way to get a jihadi video taken down from YouTube is for me to blog about it on MTP. I don’t know if this is also true of Ms. Hesse’s bio, but I can’t help noticing that it got cleaned up recently on the justice.gov website. Court may enter the proposed consent decree upon a finding that it serves the public interest. Ms. Hesse served as the Deputy Assistant Attorney General for Criminal and Civil Operations and Principal Deputy Assistant Attorney General between 2012 and 2016. During this period, she also served as the Acting Assistant Attorney General from November 2012 to January 2013. She was a career trial attorney in the Division between 1997 and 2006 [overlapping Jamie Gorelick and Eric Holder’s respective terms as Deputy Attorney General and Bill Baer’s term as head of the FTC Competition Bureau], during the last four years of which she served as the Chief of the Networks and Technology Section. 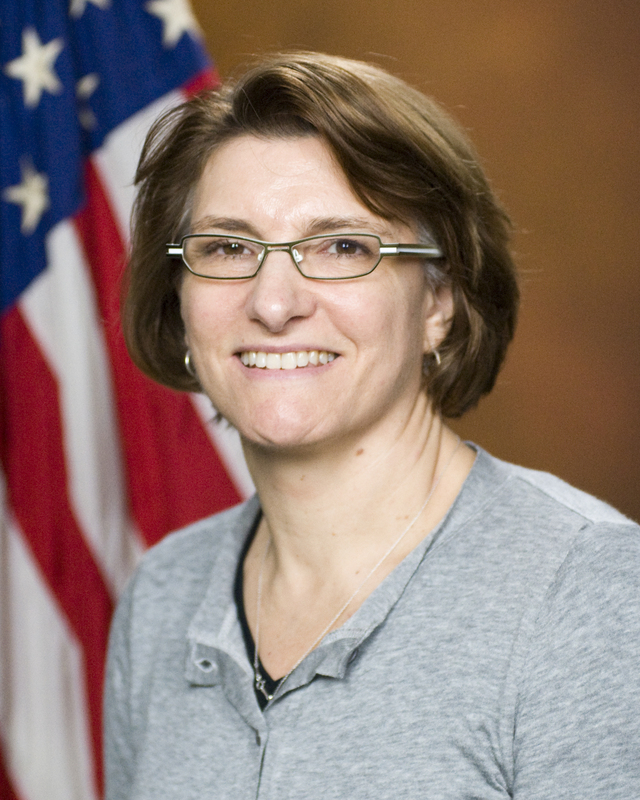 Over the course of her 15 years at the Division, Ms. Hesse has played a leading role in a number of the Division’s most challenging and important investigations and litigations, including serving as the Acting Assistant Attorney General in the Division’s review of the mergers between Comcast and Time Warner and Applied Materials and Tokyo Electron, Deputy Assistant Attorney General overseeing the Division’s challenge to the US Airways/American Airlines merger, and lead attorney during the remedy phase of the Division’s monopoly maintenance case against Microsoft. Before rejoining the Division in 2012, Ms. Hesse served as Senior Counsel to the Chairman of the Federal Communications Commission, where she was responsible for overseeing the FCC’s review of AT&T’s proposed acquisition of T-Mobile. She was also a partner in Wilson Sonsini Goodrich & Rosati’s antitrust group. No mention of Google or what happened while she was at Wilson Sonsini Goodrich & Rosati. Despite her obvious “revolving door” status, Open Secrets has not gotten around to a revolving door profile on Hesse as yet. Yet here is where the timeline gets interesting. July, 2006: Wilson Sonsini Goodrich & Rosati hires Ms. Hesse, most immediately the former chief of the Networks and Technology Enforcement Section of the Department of Justice Antitrust Division. Hesse joins WSGR as a partner in its antitrust and trade regulation practice, joining another revolving door person Susan Creighton, the former Director of the Federal Trade Commission’s Bureau of Competition from 2003-2005 (the post previously held by Bill Baer). Ms. Creighton appeared before the 2011 Senate Antitrust Subcommittee investigation into Google’s business practices along side Google boss Eric Schmidt (the hearing where Schmidt refused to answer Senator Cornyn’s questions about Google’s prosecution for violations of the Controlled Substances Act on the advice of counsel, aka taking the Fifth). Hesse and Creighton are two revolving door hires. July 29, 2010: The Google legal team consisting of Hesse, Creighton, Dana Wagner and Matthew Bye begin lobbying state attorneys general investigating Google for violations of state antitrust law. September 24, 2010: DOJ settles U.S. v. Adobe Systems Inc., et al. stopping Adobe, Apple, Google, Intel, Intuit, and Pixar from signing non-solicitation agreements for employees. The settlement requires annual monitoring by the DOJ Antitrust Division for five years. March 23, 2011: Hesse, Wagner, Bye, Creighton actively trying to make state investigations into Google’s business practices go away. April 8, 2011: Department of Justice Antitrust Division approves Google acquisition of ITA Software, issuing consent decree that set the requirements governing Google’s future operation of the ITA business. The term of the consent decree is five years and requires Google to report all complaints to the DOJ. May 20, 2011: FOIA logs from the Ohio Attorney General’s office reveal email communications between Hesse and Beth Finnerty, the Ohio AG Section Chief, referencing Ms. Hesse’s “Google portfolio” of work at Wilson Sonsini: (Hesse): “Beth: Google would prefer that you serve them directly, but cc Dana Wagner and also someone at our firm. Since I will be moving on relatively soon, I think it makes sense for you to copy Chul Pak (copied on this message) in my stead. Chul is a partner in our New York office (used to run Mergers IV at the FTC) and is going to be taking over my Google portfolio. He’s terrific and I know you guys will work well together. June 3, 2011: A Global Competition Review article highlights Wilson Sonsini’s work for Google and Hesse’s involvement in the five-partner team advising Google on antitrust matters: “Susan Creighton leads a five-partner group at Wilson Sonsini Goodrich & Rosati in Washington DC. Creighton, Scott Sher and Renata Hesse are all Who’s Who entrants…A renewed flow of deals is keeping the team very busy. It advised Google throughout the DOJ’s investigation of its just cleared purchase of ITA software. June 24, 2011: The Federal Trade Commission opens its antitrust investigation of Google. I have heard a rumor that this apology was arranged by Washington wheeler-dealer Jamie Gorelick, former Fannie Mae executive, former Deputy Attorney General under President Bill Clinton who was succeeded by Eric Holder and who represents Google in a variety of matters. And mentor of Beth Wilkenson who the FTC brought in to run the busted Google antitrust investigation. –Senior consultant to Charles River Associates before joining the Obama Administration and again from 2012 to present. Charles River Associates advised Google during the FTC’s antitrust investigation. Shapiro re-joined Charles River on November 19, 2012, days before the FTC opened settlement negotiations with Google on that antitrust investigation. April 26, 2012: Google Chairman Eric Schmidt meets privately with White House Chief of Staff Jack Lew. April 27, 2012: Federal Trade Commission announces the appointment of Jamie Gorelick crony Beth Wilkenson to oversee Google antitrust investigation because there just aren’t enough qualified lawyers at FTC’s professional staff–you know, the ones that recommended prosecution of Google. —>>May 1, 2012: Carl Shapiro meets alone with Hesse in the White House mess. This was the first White House meeting Ms. Hesse attended. May 4, 2012: Google chief lobbyist Johanna Shelton, Google Senior Trademark Counsel Annabelle Danielvarda, and Google Legal Director Terri Chen meet with U.S. Intellectual Property Enforcement Coordinator Victoria Espinel. May 7, 2012: Ms. Danielvarda, Ms. Chen and Google State Policy Counsel David Lieber meet again with Espinel. August 2012: Hesse appointed Special Advisor to the Civil Enforcement Division of the U.S. Department of Justice. October 1, 2012: Google General Counsel Kent Walker, Google Senior Patent Counsel Suzanne Michel and Google lobbyist Johanna Shelton meet with Victoria Espinel. October 11, 2012: Google lobbyist Johanna Shelton and Google IP Counsel Fred von Lohmann meet with Victoria Espinel. October 13, 2012: Bloomberg reports that FTC staff has circulated a 100 page memo recommending suing Google for abusing its dominance of Internet search in violation of antitrust laws and that the FTC is considering a separate lawsuit against Google for misusing its standard essential patents to block rivals’ smartphones from coming to market. November 6, 2012: President Obama re-elected. November 16, 2012: Google’s former Google Deputy General Counsel for Patents & Patent Strategy from 2003-2012, Michelle Lee is announced as the Director of the new satellite Silicon Valley office of the U.S. Patent and Trademark Office, in San Jose, California. November 27, 2012: Hesse meets privately with Victoria Espinel at the White House. November 30, 2012: Obama campaign manager Jim Messina meets privately with White House Chief of Staff Pete Rouse at 1:30 pm. An hour later at 2:30 pm, Rouse meets privately with the DNC’s Patrick Gaspard. And at 3:30 pm, Rouse meets privately with Google Chairman Eric Schmidt. —>>November 30, 2012, The Washington Post reports that Google and FTC negotiations avoid search issues, instead focusing on potential issues related to standard essential patents and Google’s Motorola patent portfolio. December 10, 2012: Renata Hesse, David Kappos, U.S. Patent & Trademark Office; Malcolm Lee, Department of Commerce; Terrell McSweeney, DOJ Antitrust Division; Peter Pappas, USPTO Chief of Staff; Ari Schwartz, Department of Commerce meet with Victoria Espinel. December 8, 2012: USC Annenberg releases first corporate responsibility report on brand-sponsored piracy. December 30, 2012: Bill Baer is confirmed as head of DOJ’s Antitrust Division, then investigating Google to no conclusion. February 14, 2013: USC-Annenberg calls out Google on brand sponsored piracy. April 18, 2013: Reps. Goodlatte and Schiff send letter to Randall Rothenberg at Google-dominated Internet Advertising Bureau asking for explanation of flaws in IAB “best practices” on brand-sponsored piracy. June 6, 2013: National Association of Attorneys General (NAAG) charges that Google is continuing to allow ads for illegal online pharmacies (at Summer NAAG at which I was a speaker). August, 2013: DOJ allows Google Drugs non-prosecution agreement with Google to lapse, but illegal drug ads are easily findable all over YouTube. —>August, 2013: Billboard reports that DOJ is investigating UMPG and Sony/ATV partial withdrawals from ASCAP and BMI. September and December 2013: Billboard reports that DOJ investigation into UMPG and Sony/ATV paused due to unprecedented rate court decisions barring partial withdrawal from ASCAP and BMI. The BMI/Pandora rate court ruling means if Pandora doesn’t cut some kind of deals with publishers like Universal Music Publishing Group, BMG and Kobalt — who all have notified BMI that come Jan. 1, they intend to withdraw their digital rights — Pandora could be in copyright violation if they haven’t pulled those songs by that date. Judge Louis L. Stanton has ruled the exact opposite of what occurred when Pandora squared off with ASCAP — a rival collection society to BMI — at another rate court hearing on Sept. 17. Judge Denise Cote ruled that Pandora had a license in effect and were covered by the ASCAP blanket license, including songs from all the publishers that intended to withdraw. Yet both judges came to the same reasoning on how the consent decrees disallow the partial withdrawals of rights. Stanton agreed with Cote that publishers are either all in or all out, a position which was bolstered by Ethan Glass, a lawyer from the Department of Justice [then Assistant Chief of the Litigation III Section, now a partner at Quinn Emmanuel, Google’s “go-to” patent lawyers]. March 2014: Reps Bob Goodlatte and Adam Schiff send “Dear Colleague” letter to House members calling out ad-sponsored piracy. April 2014: Billboard and Politico report that Justice Department is leading industry sources to believe that it will amend consent decrees. June 2014: DOJ announces review of ASCAP and BMI consent decrees by Litigation Section III, the unit of the Antitrust Division that regulates the entire entertainment industry including the music business under command of Ms. Hesse. No mention of 100% licensing. 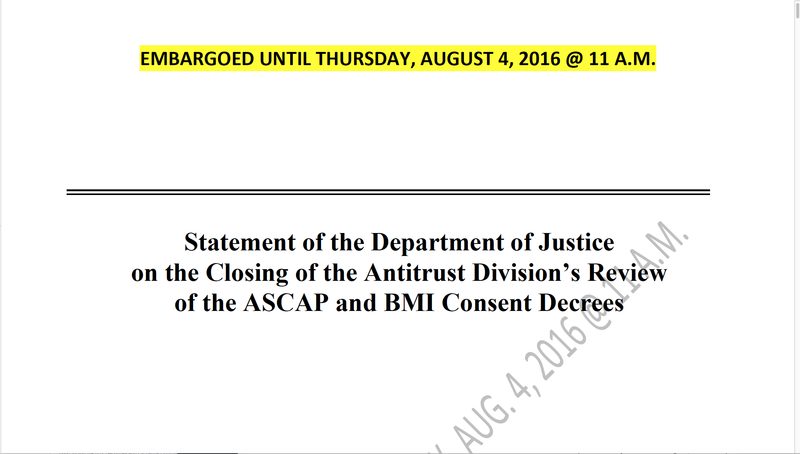 June 6, 2014: DOJ Litigation Section III requests public comments on general review of ASCAP/BMI consent decrees, no mention of 100% licensing. —>July 2014: Billboard reports that DOJ sends CID to ASCAP, BMI, Sony/ATV and UMPG regarding “alleged coordination among ASCAP, BMI, Sony/ATV Music Publishing, and Universal Music Publishing Group” presumably at the request of music users including Pandora, Google and other DiMA members. August 6, 2014: Deadline for filing public comments on consent decrees. November 8, 2014: Loretta Lynch nominated for Attorney General. November 12, 2014: Global Music Rights told The Hollywood Reporter that their writers are prepared to take 42 of his clients, representing some 20,000 copyrighted works, away from the YouTube ecosystem, including the new Music Key. November 26, 2014: Broadcasters request payola waiver from FCC. December 2014: Pharell Williams notifies YouTube he is pulling his songs from YouTube. April 15, 2015: European Commission sends antitrust complaint to Google for violations of EU competition law. May, 2015: Google, Pandora and companies with market cap over $2 trillion form MIC Coalition to lobby against songwriters. —> August 17, 2015: MIC Coalition sends letter to Hesse requesting investigation of SESAC. Google and Pandora are both members of the MIC Coalition, as are DiMA and the Consumer Electronics Association of which Google and Pandora are members. —> September 22, 2015: DOJ Antitrust Litigation III Section requests public comment on 100% licensing. October 2015: Pandora and Google lawyers request a vote from ABA IP Section on resolution that supports DOJ position on 100% licensing, which is voted down by experts, does not pass and is withdrawn. November 2015: DOJ closes public comments on 100% licensing. January 12, 2016: Rep. Doug Collins requests that the Copyright Office opine on the legal validity of 100% licensing as contemplated by the Department of Justice. January 29 2016: Copyright Office responds to Rep. Collins with report on “full work” licensing that rejects DOJ’s ultimate position. April 15: 2016: Hesse appointed Acting Assistant Attorney General and head of the Antitrust Division. July 2016: Kully holds conference calls with songwriters attempting to get them to believe that 100% licensing is normal and seeking industry acceptance of rule change. Songwriters reject this idea forcefully. Kully refuses to send a draft of the regulation, instead reading draft aloud over the telephone. Kully refuses to answer a direct question of whether the White House is involved in decision on 100% licensing. Kully attempts to solicit criticism of 100% licensing, but songwriters believe this is not in good faith as it would be to DOJ’s advantage to manufacture some kind of industry consensus. July 7, 2016: Kully tells songwriters that the ruling is coming whether they like it or not. Ruling to be released on July 29. July 29, 2016: Kully leaves a voice mail on songwriters phones telling them the release has been delayed. Selected journalists receive copy of regulation embargoed until August 4. August 4, 2016: DOJ releases “statement” with no attribution to any person. Entire creative community reacts negatively, Public Knowledge and MIC Coalition take victory lap. As usual, Google is silent. As usual, impressive research and oversight by the author on this troubling situation. Rarely have I seen such a consistent response from the entire songwriting and publishing community. Let’s see how the DOJ stonewalls their way through this decision or if democracy still works when push comes to shove. It looks like something has happened at DOJ. Just search copyright at usajobs.gov and three division chief job openings come up related to copyright. So apply now before another google lawyer is hired….. Wound up here while researching what other instances could be found in which a government agency could overreach in direct opposition to the clearly expressed position of a community of people and thus betraying the interests of those whom they have been tasked to protect… seems like a disturbing trend. As if a body of people got together, turned crazy and then started creating sweeping legislation that decimates small industries and consolidates them into the hands of one or two big players. And its all over the place. The only other explanation besides an outbreak of airborne chronic bureaucratic microcephaly is intentional systemic corruption. From Mid-Western cherry farmers to personal vaporizer enthusiasts, New York City process servers to songwriters… Oi! Time for an internet break. Good luck with your fight, it is going to be a long haul, y’all.